It's hard to find the words to describe something like this. However, phrases like "holy grail" and "I can't believe we found one!" come to mind. In fact, this 2-door FJ28 Land Cruiser is so rare, that none of us have ever seen one in the flesh. 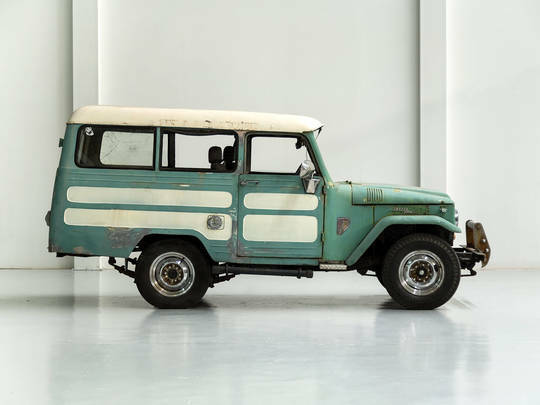 The FJ28 was only produced from 1955 to 1960 and it is known for its distinct bodywork. The beautifully weathered beast shown here was discovered in Mexico by our team. Its steel body features a unique grid-like design on the side-panels and a massive rear overhang. Up front, you'll find the rounded two-stamp hood, a relic of early production processes, and the iconic 20-series grille with its chrome-plated bars. The FJ28 was created for those who wanted all the capability of a classic Land Cruiser, and more space for people and cargo. It was longer than the FJ25 (the flagship of the series) and had an additional third seat in the luggage area. In other words, there’s plenty of space to play with. As for what will become of this FJ28, that's up to you. Commission this project from us, and you get to decide whether we return it to its original glory or create something completely custom. Want an updated drivetrain? No problem. Our team is ready to transform this gorgeous blank canvas into whatever you desire. Like what you see? Fill out the form below and we'll be in touch. Serious inquiries only.